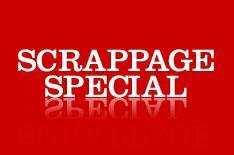 How scrappage works - part two | What Car? The car you buy must be first registered to the same person who was the registered keeper of the car being scrapped. That means you won't be able use the incentive on one of the many cars that may have been pre-registered by dealers as sales started to slump. There's no CO2 emissions cap on the scheme, however, so you could use it to subsidise the purchase of a 197,460, 495g/km, Murcilago supercar (assuming Lamborghini is keen to take part). The Government says dealers will scrap your car for you and do all the paperwork, which means, if you're not careful, that you could lose out on some of the What Car? Target Price discount you should have been aiming to achieve in any event. Our Target Price shows the most we think you should pay for any new car, the average saving currently standing at a scrappage-matching 1975. You won't make many friends among dealers, but we think by far the best tactic is to use our Target Price to achieve the best discount you possibly can, and then ask for a further 2000 if youve got an eligible 10-year-old car.